You will be directed to a famous deep dish pizza institution, highly recognized as one of the best makers of deep-dish pizza. You will eat authentic Chicago-style pizza. Ill encourage you to Jeppson's Malört—an infamous Swedish schnapps that is made with wormwood and loved/hated by locals. 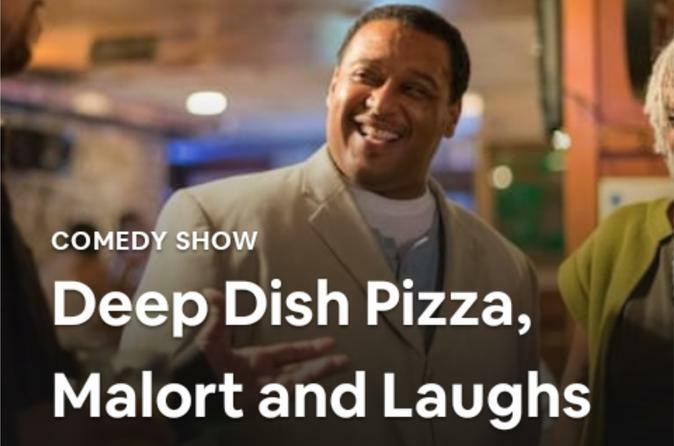 Then you will catch a Standup comedy show in an authentic Chicago Stand-up venue —one possible show title is "why your brain does the things it does when drunk, like calling your ex or eating greasy food". We will meet and talk to at least one performer. Is a 20-year veteran of the Chicago comedy scene. An original and edgy stand-up comic. I own Seestandup.com, and co-host the Dr. Sanders show on WVON 1690 AM radio. I'm also a past core face on Empire and Chicago PD. Chicago Fire and Chicago Med. I've also been a contributor to Spike TV's "Totally Biased with W. Kamau Bell."